I picked this book because I've had a bit of a girl-crush on Anna Kendrick since falling in love with all the Pitch Perfect movies. Can't wait til this August for the newest one! So it follows that I've counted this book for the 36th category of the Pop Sugar Reading Challenge - a book written by someone you admire. Her snark is out of the park and I love it! 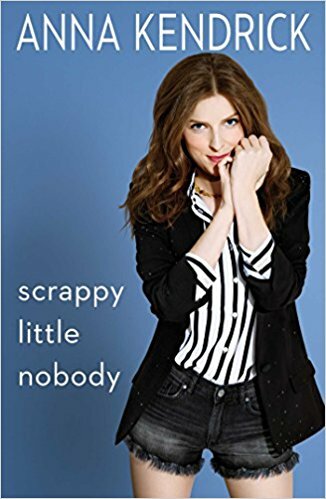 Scrappy Little Nobody is an autobiography by Anna Kendrick. I loved hearing about her modest beginnings, and life-long dreams of acting and singing. Her Broadway start and continual casting as a child because of her petite stature was amusing, and her voice in telling it sounds like so many of her sassy characters. The book has also given me a list of more Anna Kendrick movies to enjoy. Hubby and I had already seen Cake, both Pitch Perfect movies (repeatedly), Into the Woods, Trolls, and the Accountant (to name just a few), but once I read of her working on a few other movies, we also checked out Mike and Dave Need Wedding Dates, and Camp. I also now want to see Rocket Science, Life after Bex, and Up in the Air soon. I love Anna Kendrick so I'm glad you liked this book, I'm hoping to read it at some point. Also I forgot she was in Cake! Great movie. I love her! Definitely adding this book to my list! Anna Kendrick is such a lovely human being. Lover her works! Amazing! This looks like a fun read. I want to read it now. She's so cute.